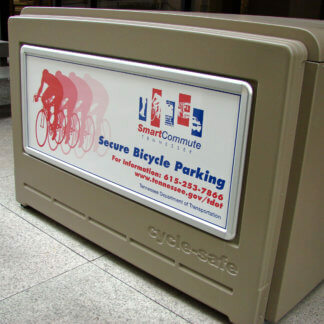 CycleSafe ProPark® Side-View™ bike lockers have a weatherproof, shatterproof, 23” x 60” polycarbonate end panel with interior clear polycarbonate partitions to allow instant visibility into locker contents for security and locker availability. ProPark Side-View bike lockers are specified as stand alone starter units, or extended into rows with adder units. How Many Lockers in a Bank? Sandstone is standard. Others include upcharge. T-Handle is standard. Others include upcharge. More about lock options.